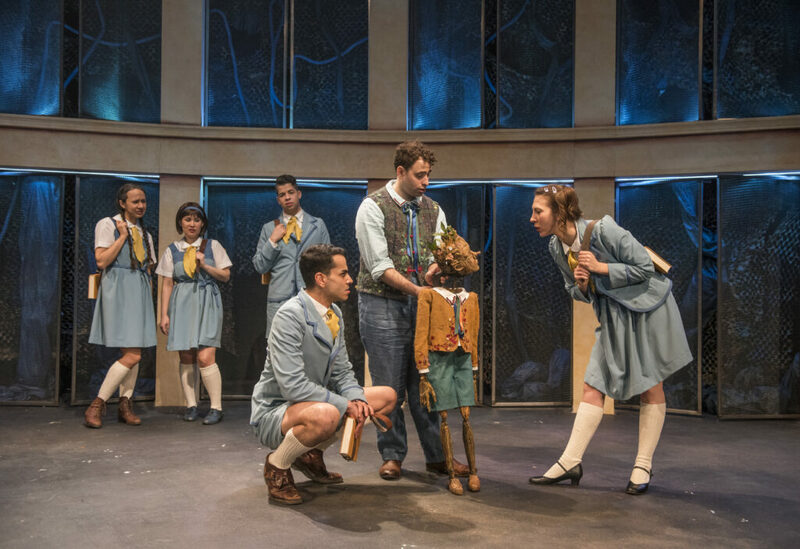 House Theatre of Chicago presents the World Premiere of PINOCCHIO. The name, ‘Pinocchio’, gets amusingly butchered throughout this reimagined children’s classic. The mispronunciation of the name is an ongoing joke in the witty script. Adapters Joseph Steakley and Ben Lobpries have updated the well-known puppet story. Although they provide fun with plenty of spirited antics, their overarching message is more profound. 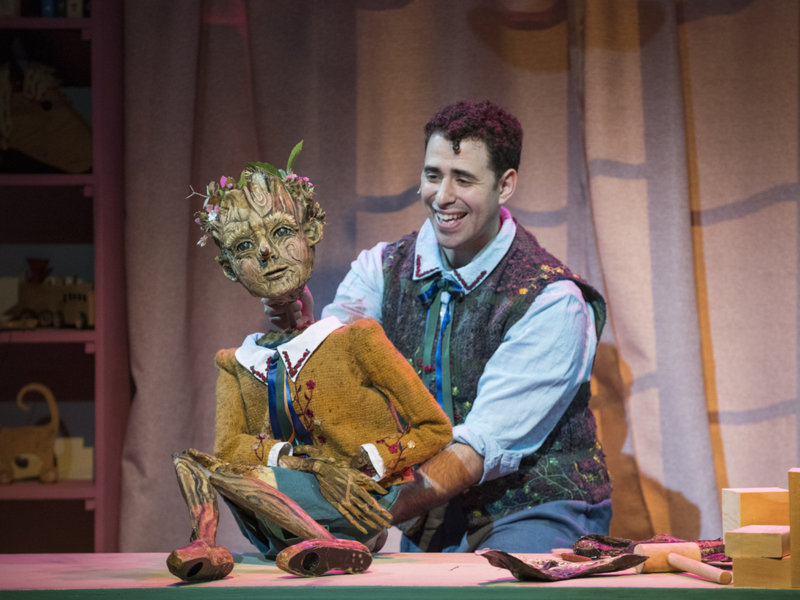 Instead of focusing on a puppet’s quest to be a real boy, Steakley and Lobpries’ Pinocchio wants to be accepted as he is… wooden, from the forest and a composer of a new musical. 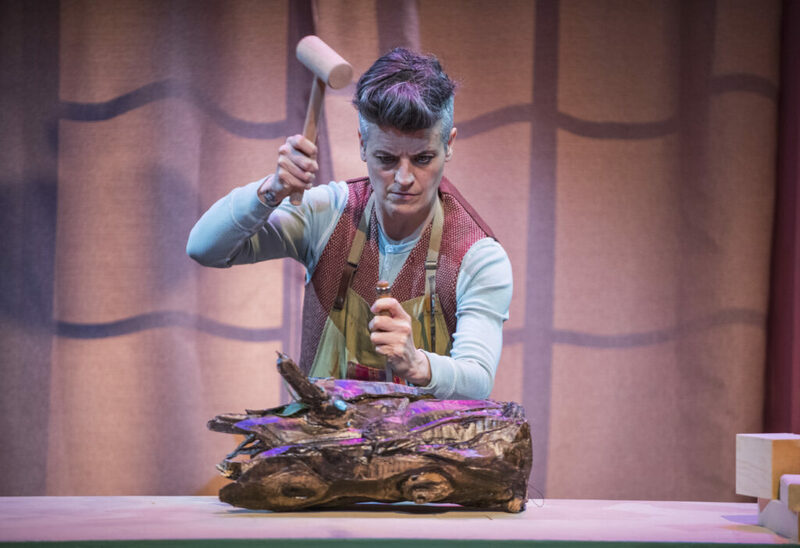 Geppetto (played by Molly Brennan) and the townsfolk grapple with accepting someone different from their small-minded, book burning village of intolerance. Steakley and Lobpries’ reinvention has unexpected depth and beauty. The star of the show is Pinocchio, a puppet created and crafted by Tom Lee of Chicago Puppet Studios. 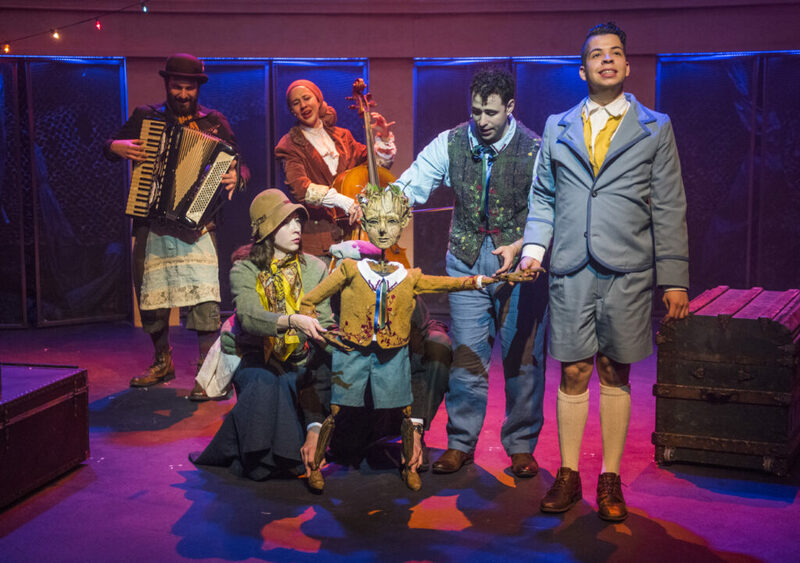 A masterful Sean Garratt brings Pinocchio to life and gives him personality. Garratt endears as he refuses to conform to toy norms and sitting on a shelf. He won’t ‘play dead.’ He lives, learns, laughs and loves as he ventures out into the world. Steakley and Lobpries have given their Pinocchio an intellectual curiosity. His adventure isn’t puppet mischief. He wants to understand the world and his place in it. When he befriends and dances with the delightful Brandon Rivera (Romeo), I’m transfixed in wonder! Pinocchio has a simplistic earnestness that made me want to adopt him. Director Chris Matthews seamlessly navigates the action from store to school to forest to whale stomach. His creative team (Joe Schermoly-scenic, Alexander Ridgers-lighting, Anna Wooden-costumes) support the story with evolving and interesting visual aides. The edge of the forest also serves as screens for projections. The terrific ensemble is dressed in matching school uniforms or early 1900s prim sensibility. I really enjoyed most all aspects of this production. At my performance, some of the singing was flat which momentarily broke the spell of enchantment. Still, I wholeheartedly recommend House’s PINOCCHIO.